Researchers using NASA's Chandra X-ray Observatory have announced the discovery of a huge assortment of extrasolar planets ranging in size from Earth's moon to the planet Jupiter. An extrasolar planet, or exoplanet, is any planet found outside of our own solar system. The announcement was made by Xinyu Dai and Eduardo Guerras of the University of Oklahoma's Department of Physics and Astronomy, and published in The Astrophysical Journal Letters on February 2nd. On its face, this news may not seem extraordinary; these days, announcements of new exoplanet discoveries come out monthly, if not weekly. The jaw-dropper here is where they were found: in a very distant galaxy, 3.8 billion light years away, wandering free as "rogue" planets in the darkness between the galaxy's stars. Even more mind-blowing, the observational data indicates that there may be as many as 2,000 of them for every star in that galaxy. In a galaxy that is 3.8 billion light years away, even individual stars cannot be seen — only the combined luminous "smudge" of multitudes of stars. So how is it possible to detect much smaller, non-luminous objects like planets at that distance? The short answer is that this wouldn't be possible, were it not for a phenomenon called gravitational lensing: the bending and focusing of light from a distant object by the gravitational field of another, intervening object. The phenomenon can be likened to how a glass hand lens bends and focuses light, magnifying a light source — but in this case the "lens" is the gravitational field of a massive object in space. 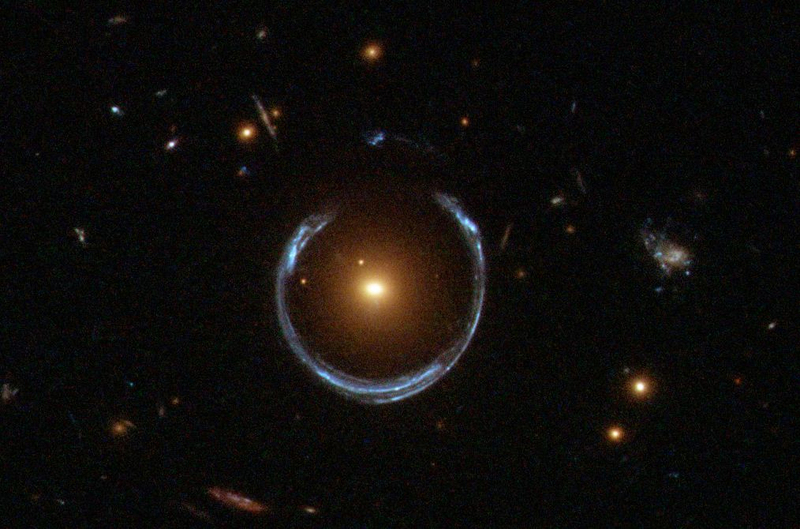 Gravitational lensing was predicted by Einstein's theory of Relativity, and has been observed and tested for decades. On a grand scale, gravitational lensing by enormous clusters of galaxies has been observed to magnify much more distant, background galaxies, yielding not only images of the background objects, but a measure of the lensing cluster's mass based on the degree of light bending. 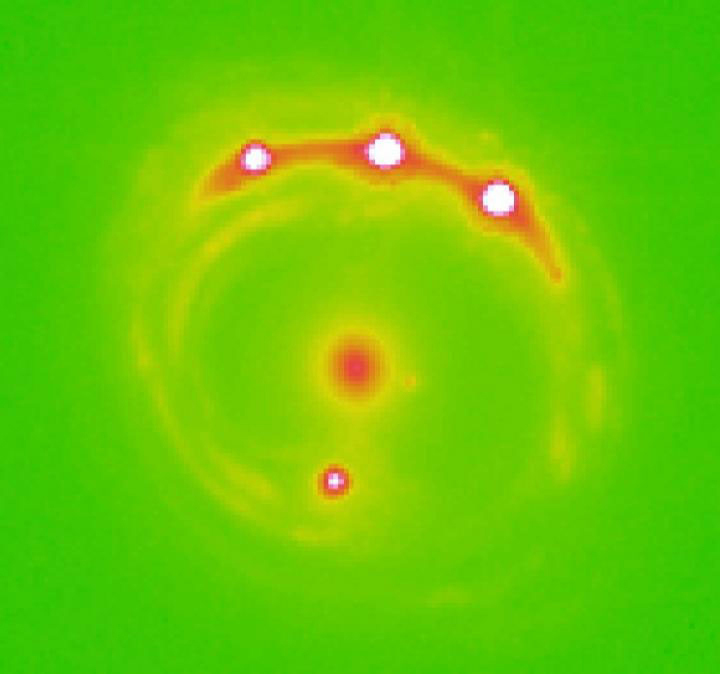 On a smaller scale, within our own galaxy, astronomers have detected almost a dozen exoplanets through gravitational lensing — or microlensing, in the case where the lensing object is a single star or planet. The first detection came in 2003, when an object named OGLE 2003-BLG-235 passed between Earth and a more distant star. As it passed, the object's gravity bent and focused the star's light toward us, temporarily magnifying it. The amount of amplification of the star's light allowed astronomers to calculate the interposing object's mass as 1.5 times that of Jupiter, which in turn identified it as a planet (as opposed to something more massive, like another star). But the detection of a single exoplanet by the gravitational microlensing of a single star's light is a game that can only be played within our own galaxy, at distances where a singular star can be observed. Detecting exoplanets across 3.8 billion light years is a whole different ballgame. 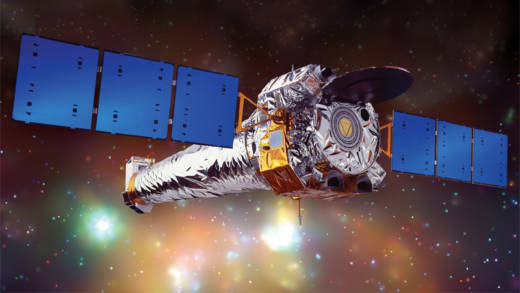 Dai and Guerras took advantage of the microlensing phenomenon on a grand scale, using the Chandra X-ray Observatory to measure the emissions of a quasar positioned behind their target galaxy. A quasar is the extremely luminous core of a galaxy with an active, supermassive black hole at its center. Analyzing the X-ray data from the background quasar, they searched for microlensing effects caused by any objects within the intervening galaxy, and a pattern emerged -- one that could only be explained by the presence of large numbers of planet-sized objects, drifting independently between the galaxy's stars. Though no individual exoplanets were spotted -- the distance is too great for that -- the patterns produced by multitudes of planetary bodies revealed the exoplanet population. To push an analogy, if you've ever seen a halo around the sun then you might get a sense for how these exoplanets were detected. A sun halo is formed by the combined bending (or refraction) of sunlight caused by multitudes of water droplets or ice crystals in the atmosphere between you and the sun. Though the droplets are too small and too far away for you to see, their combined effect on the sunlight makes their presence known, and the size and colors of the halo can indicate the properties of the refracting particles. 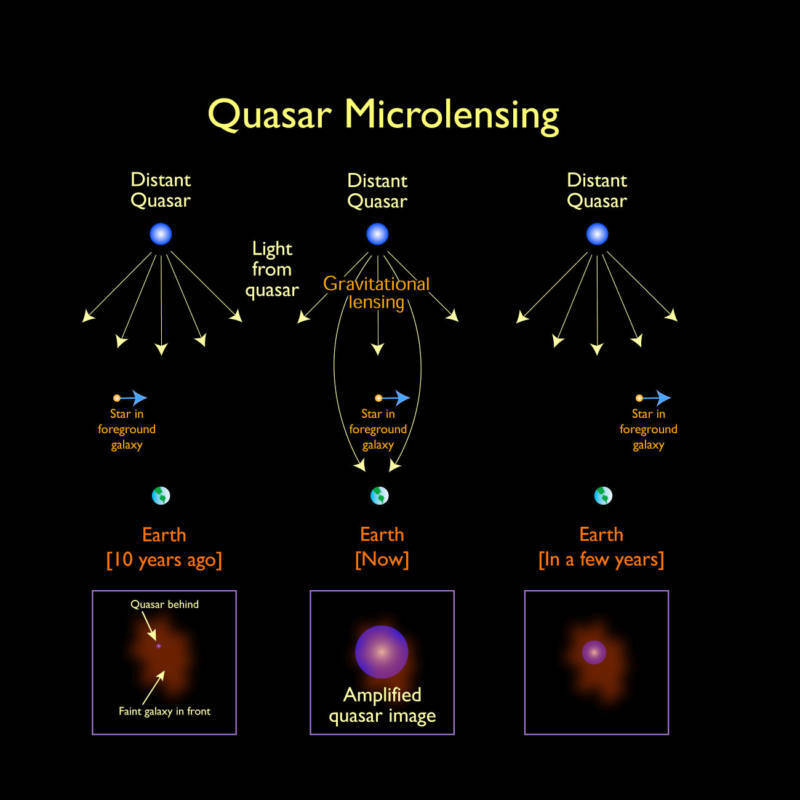 In a sense, the X-rays shining from the background quasar passed through a "mist" of exoplanets, and the pattern of their combined microlensing effects revealed them to us. Until now, all the confirmed detections of exoplanets, numbering more than 3,600, are located inside our Milky Way galaxy, and almost all of these orbit stars. In fact, it is because these exoplanets orbit stars that we can detect them at all. The two main ways for finding exoplanets, the "radial velocity" and "transit" methods, depend on it. These methods have turned up thousands of exoplanets in the Milky Way — especially the transit method, which NASA's ace exoplanet hunter, the Kepler spacecraft, has used to confirm 2,341 of all known exoplanets (as of February 8). The estimate of 2,000 rogue exoplanets for every star in that distant galaxy is an astounding figure. It means that there may be trillions of planets floating around that one galaxy. Does this mean that other galaxies possess similar populations of rogue planets? Is our own Milky Way galaxy filled with unseen, dark worlds lurking in the space between the stars? It has been estimated that there are more stars in the universe than grains of sand on all of Earth's beaches. Move over stars; you may be far outnumbered by planets!